Samantha Akkineni’s cute pics that she shared on on social media are making fans ponder. 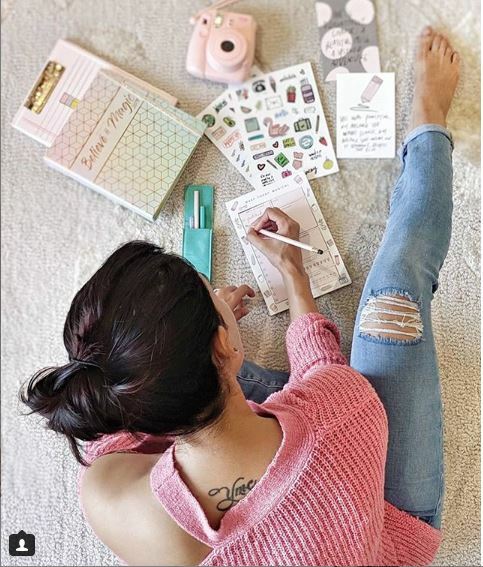 Sam is seen pretty in pink sweat shirt and torn denims scribbling her Christmas plans. “Those of you who know me, know I love stationery and love @artchetypestudio. Last year I gave all my friends Cubo planners for Christmas. So this year I thought, why not give you guys a little surprise… .” caption she. 2018 has been most successful for the Akkineni lady with variety of roles and commercial successes of Rangasthalam range. Guess what Sam is going to gift her fans who gave this stupendous success. “I want to GIFT 50 of you my favourite planner from @artchetypestudio.. As we begin the New year, instead of focusing on everything that’s not going right for us let’s try focusing on what is going to make us happy and positive … My top 3 priorities for 2019 for a happier and more positive year would be – 1) Being grateful 2) More empathetic and 3) Making peace with green leafy vegetables .. What are your top 3 goals for the New year?”shares she.